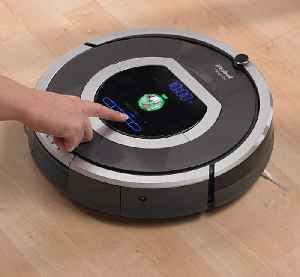 Roomba is a series of autonomous robotic vacuum cleaners sold by iRobot. Introduced in September 2002, Roomba features a set of sensors that enable it to navigate the floor area of a home and clean it. For instance, Roomba's sensors can detect the presence of obstacles, detect dirty spots on the floor, and sense steep drops to keep it from falling down stairs. Roomba uses two independently operating side wheels, that allow 360° turns in place. A rotating, 3-pronged spinner brush can sweep debris from square corners to the cleaning head.